Hi everyone, just letting you know that Ruger is still growing. He turned 2 in October. He stands a foot taller than my Labrador retrievers, but only weighs 95 pounds. He seems to be filling out still. I think he will fill out and be a little over 100 pounds when he is done growing(?). I posted pics of him and his self found tree stump that he used for a ball. For his birthday we got him a 12" Jolly ball. It is a hard large ball that he CANNOT pop. He loves it, talks to it, and chases it across our yard. Thanks so much for sharing him with us. 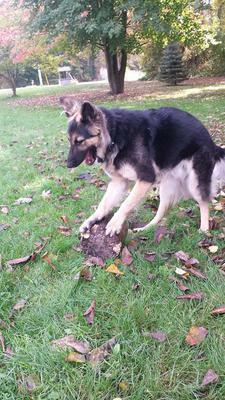 That is so funny about him making the partial tree stump as a ball. German Shepherds are very intelligent and very inventive too so almost anything has the capabilities of being a toy. Continued success with Ruger and send us some more pictures of your German Shepherd if you ever get the chance. We would love to see them for sure.